Working on the visuals for the DRACULA series on NBC was a project I really sank my teeth into. Being a freelance artist in Hollywood allows me to stretch my bat wings around many types of work, including film and TV marketing , PR shoots and key art. In this coffin case, the task at hand was creating promotional posters capturing the essences each of the show's main characters. Eight of them. In ten days. To launch at San Diego Comic-Con. Um, ok. Sure. I can do that. Co-conceived and designed at Rick Floyd Inc with designer William Anzevino, the direction was a "kaleidoscopic fashion editorial steampunk tarot card deck" look for each actor surrounded by their unique props and elements. Starting with sketches and roughed photo comps, and receiving raw, un-retouched photos back from the photographer on set location in Budapest, Anzevino and I didn't sleep for days and we met the vampiric (un)deadline. In addition to this aspect of the project, I spent several weeks working with Rick Floyd's team, as well as the folks at NBC/Universal designing key art. In blood. 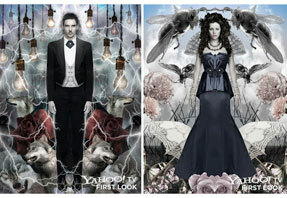 Have a look at a sample of my creative process for NBC's Dracula here. You can view a full gallery of images here. 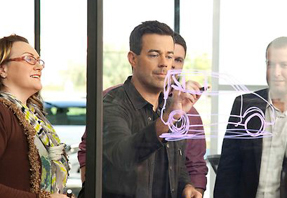 Recently I was invited to draw in FRONT of the camera, Carson Daly, Kia for The VOICE on NBC. For those of you living under a rock, void of the pop-cultural Zeitgeist, The VOICE is a vocal competition show with Celebrity musicians/coaches Adam Levine, Christina Aguilera, CeeLo Green and Blake Shelton with Carson Daly serving as host. The show's innovative and fair format features four stages of competition: blind auditions, battle rounds, knockouts and live performances.